Warren Perrin, an Erath native, holds the book that inspired his journey to receive an apology from the Queen of England entitled The Acadian Miracle.A great wrong was committed against the Acadian people between 1755 and 1763, during Le Grand Dérangement, when the British government expelled them from their homeland, Acadie, now known as Nova Scotia. More than a decade ago, Lafayette attorney Warren Perrin embarked upon what some believed to be a fool’s errand to obtain official acknowledgement of their transgressions by the British government for the descendants of the Acadians. Perrin set out to obtain an apology from Queen Elizabeth II to not only the Cajuns of southwest Louisiana, but also their cousins on both sides of the Atlantic — the Acadians of the Maritime provinces of Canada, those whose ancestors were assimilated into the colonies of the eastern United States and those whose ancestors repatriated to France. Support for the idea gradually grew over the years throughout the international Acadian community and acknowledgement finally came on Dec. 9, 2003 in the form of an official proclamation issued under the auspices of Elizabeth II, Queen of Canada, signed by Adrienne Clarkson, governor general of Canada, the crown’s representative in North America, and other Canadian officials. The proclamation was presented in a ceremony attended by numerous officials of the Canadian federal government. In addition, July 28 was set aside as a day of commemoration for the Acadian exiles. These events came as a result of an official inquiry into the events that led to the expulsion of the Acadians conducted by Sheila Copes, Canada’s minister of culture, all part of Perrin’s requests. 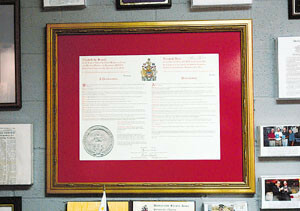 A proclamation from the Queen of England apologizing to the Acadians, rests on the wall of Warren Perrin's Erath office.Perrin’s odyssey was an up-and-down ride that began in 1988 with a bedtime story. “I had a young son, Bruce, who was 6 or 7, and I was trying to get into Acadian history,” Perrin said. “I would read a little book that I picked up in Nova Scotia to him. Perrin’s concerns about the historical image of Acadians is valid, according to John Mac Faragher, a Yale University American history professor whose book on Acadian history is set to be released in the spring of 2005. “The Acadian expulsion is the first state-sponsored example of ethnic cleansing in North America,” Faragher said. Families were separated, hardships were endured and thousands died as an entire population was uprooted. Perrin began researching the question of the expulsion and found the seed of his idea in “Acadian Miracle,” a book written in the first half of the 20th century by the late state Sen. Dudley J. LeBlanc. Those Acadians and their petition were rebuffed by the king, Perrin said. Perrin also stated that if the issue were not addressed, a lawsuit would follow within 30 days. On the 28th day, Perrin got a call from the British goverment’s information agency in New York, saying that their attorneys would be in touch. “That really shocked me. I didn’t expect a response.” That was the beginning of a 12-year negotiation process with the British government through a Houston law firm. 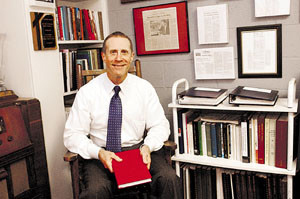 A number of ideas were proposed in the course of the negotiations, including an offer about three years into the process to establish a chair for Acadian studies at the University of Southwestern Louisiana, now UL Lafayette, endowed by the British governement. But there was a catch. “They insisted on imposing a confidentiality agreement. We could never discuss this publicly and we could never say who founded the chair for Acadian studies,” Perrin said. Sometimes, the climate was less than amicable, Perrin said. Through their lawyers, the British said if he went forward with the lawsuit and lost, they would seek damages. “It’s kind of scary when you’re dealing with a country with resources that could keep you in court the rest of your life. In the meantime, Perrin was attracting the attention of the press in various parts of the world. At one point, when invited to a conference in Nova Scotia, Perrin replied that as an Acadian, he was still forbidden to set foot on Nova Scotian soil under penalty of hanging. “That made headlines in Canada,” he said. Help came from local officials, like U.S. Sen. John Breaux and state Rep. Jimmy Hayes, who opened doors for Perrin’s efforts. In 1999, during the Congrès Mondial Acadien in Lafayette, Perrin forged an alliance with Euclide Chaisson, then-president of the Société Nationale de l’Acadie, the oldest and largest of all Acadian organizations, home-based in Moncton, New Brunswick. The organization serves as an umbrella for a number of Acadian interests and has affiliates around the world in such places as Maine Massachusetts, France, Luxembourg, Belgium, the Falkland Islands and Lafayette — the Council for the Development of French in Lousiana, better known as CODOFIL, of which Perrin is president, is also an affiliate. Members and other Acadians in Canada were polled to find out what would satisfy them in terms of redressing the issue. With the support of the SNA, the movement grew. Then-Canadian Prime Minister Jean Chretien also gave his official support. The SNA, acting on behalf of all its member groups, sent a letter to the queen asking her to address the issue. “Six months later, she answered, saying that she would ask her ministers to look into it,” Perrin said. The SNA filed copious amounts of paperwork with the federal government of Canada. “There were 128 briefs presented by individuals and groups,” Cyr said. Negotiations eventually led to the proclamation at the end of 2003. Perrin said he is satisfied with the results, especially in light of the fact that the events of the mid-1700s took place in Canada under the direction of the king’s provincial council.